The result of Standard penetration test (SPT) is number of blows N (penetration resistance), needed to penetrate a sampling device to the soil or rock by a so called Interval of penetration depth 0,3 m (1 ft). The number of blows N measured during the SPT test is correlated for the reason of various testing devices and for influence of weight of overburden in sands. Corrected (correlated) value N60 is used in calculations. Energetic ratio of testing device Er represents the ratio of real energy Emeas and the calculated energy Etheor of the ram. It is not a necessary to use a correlation for a standard SPT device (Mohr), because efficiency of its machine is 60 % and correlation is performed to this value (the values measured during SPT test are used). Correlation CN for vertical stress σ'V - represents the influence of weight of overburden in sands. The values of the correction factor CN greater than 1.5 should not be used (according to EN ISO 22476-3 recommendations). User’s correlation λ [-] - represents the loss of energy due to the length of the system of rods, the impact of borehole diameter, or the influence of the sampling device. The result of SPT is its process plotted as a graph. The evaluation of standard penetration tests are used as input parameters for the analyses in the "Micropile" and "Spread Footing CPT" programs and for stratigraphic modelling in the "Stratigraphy" program. 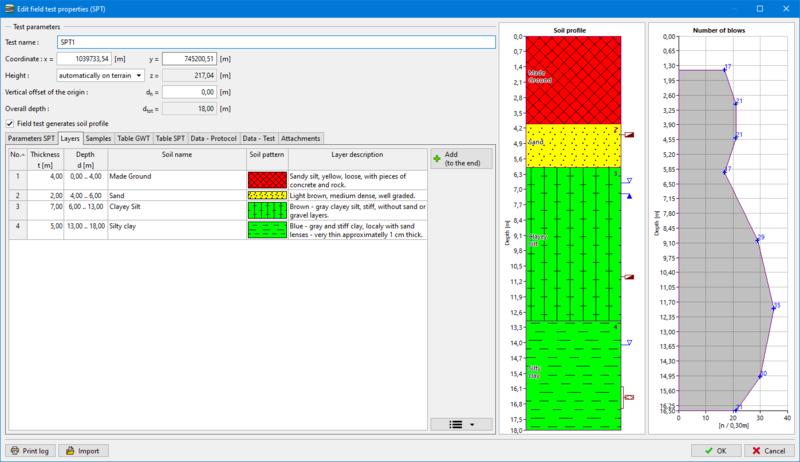 Standard penetration tests can be imported into the program as .txt data. The name of the test and the depth of the first point of the SPT is entered in the "New field test" dialog window. In the "Stratigraphy" program, input of coordinations x, y, z is required. The number of blows is entered in the table. EN ISO 22476-3: Geotechnical investigation and testing - Field testing. Part 3: Standard penetration test, 2005.